The volunteer policy of the city of Maastricht needs an overhaul. The budget will be reduced, while responsibilities of citizens are increasing. Due to the decentralizations in the social domain, their responsibilities will increase even more in the future. This calls for new forms of collaboration. And a new volunteer policy. What should the new policy look like? The city wants to design this together with its stakeholders. Residents and community workers, volunteer organizations and new initiatives, councilors, aldermen and policy makers. Because they will have to implement it together as well. The city asked Perspectivity to facilitate a participatory process. In a series of large and small group dialogues, stakeholders explore the issue, envision the future and research what is needed to realise their desired future. By bringing the broad stakeholder field into constructive conversations together, new insights are created as well as increased understanding and trust for future collaboration. Petra de Boer designed the trajectory in close cooperation with city officials and councilors and facilitates the meetings. 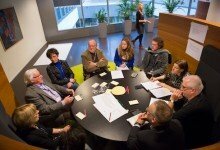 “The result was a very high turnout of voluntary health and care organizations as well as city officials and councilors and many positive comments about the way in which the dialogue has taken place.” (Note Shaping the future of volunteering together, Municipality of Maastricht).